Dante Alighieri (1265-1321) is both the founder and the best knoewn poet of Italian literature. His poem La Divina Commedia, a journey through Hell, Purgatory and Heaven, was written in volgare the everyday language spoken in Florence which mainly because of the success of the poem became the basis of Italian and in a sense of the Italian nation. The verses have eleven syllables and are grouped in triplets rhyming aba, bcb, cdc, etc.. The poem has many references of a general nature which reflect the feelings of Dante towards the great past of Rome. 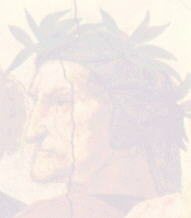 Dante visited Rome in 1301 as a member of a delegation sent to Rome to try to understand the objectives of Pope Bonifatius VIII, who had repeatedly tried to influence political developments in Florence: some specific references he made in his poem to Roman sites are no doubt related to that journey. There are several English translations of La Divina Commedia, the best known being that by Henry Wadsworth Longfellow (used in this page) who chose to keep very close to the original, even when the structure of the sentence did not suit English syntax. At the times of Dante, the Italian city-states were split between those supporting the Pope (Guelphs) and those supporting the Emperor (Ghibellins): the split often existed inside each city with political factions claiming to support one or the other. The split had much more to do with business than ideals. So because Pisa was Ghibellin, Florence turned Guelph and in Florence the Guelphs were split into White Guelphs and Black Guelphs. 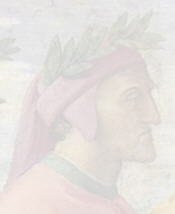 Dante supported the White Guelphs, but while he was in Rome, Charles of Valois, brother of the king of France, acting as envoy of the Pope, entered Florence with a small army to settle the disputes between the two Guelph parties. He favoured the appointment of a new Black Guelph government and the subsequent ousting of the members of the rival party. Dante never returned to Florence and for twenty years he lived at the courts of Italian princes, mostly in Verona and Ravenna where he died in 1321. He expressed his political theories in a lengthy treaty (De Monarchia) and in a more effective way in describing the two suns of Rome (the Pope and the Emperor) each enlightening a specific aspect of life. The historical reference is rather forced because the recognition of the Christian religion by Constantine almost coincided with the move of the Empire capital to Constantinople. 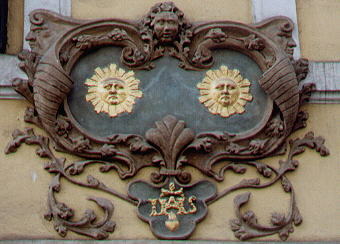 The picture shows a detail of dum U dvou sluncu (house At the two suns), 47 Nerudova, Prague. La Divina Commedia abounds in comparisons, which are often the highest points of the poem. After the long journey through Hell and Purgatory and nearing the end of his tour of Heaven, Dante is admitted to the vision of the saints and he compares his wonder at this sight, with that of a barbarian coming from northern Europe (the regions under the nymph Helice, a symbol of the Great Bear), who first sees Rome. The impact of first seeing Rome was described by many Latin writers, including Virgil who is the guide of Dante in the poem (in Hell and Purgatory). 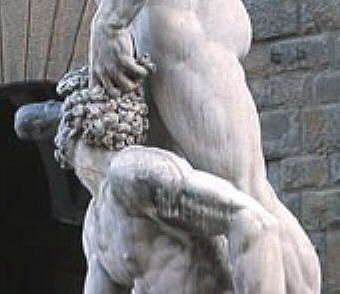 The picture shows a detail of a statue of a barbarian prisoner in Arco di Costantino: the face was restored by Pietro Bracci in 1733. In these verses Dante made an appeal for intervention to the (German) Emperor who neglected his duties and left Rome in a state of abandonment (when Dante wrote them even the Pope had abandoned Rome), but the triplet expresses a more general nostalgia for a past of fame and power. The glory of the past compared with today's misery and in general the heritage of ancient Rome is something Italians have had to deal with for centuries. From the vindication of direct links with ancient Rome of many Italian cities (such as Venice and Siena) to the attempts to revive the Roman empire by Mussolini, the past continues to influence the way Italians see themselves (and foreigners see Italians). 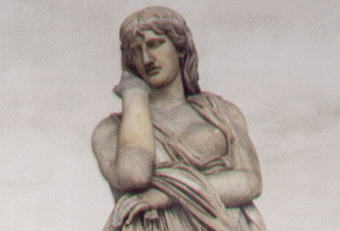 The picture shows a detail of an ancient statue called Tusnelda or Germania vinta in Loggia della Signoria in Florence. Many believe that this comparison made by Dante between the orderly flows of sinners in Hell and of pilgrims during the Holy Year 1300 is evidence that Dante was in Rome during that year, but the matter is still debated. Pope Bonifatius VIII called the first Jubilee or Holy Year in the year 1300 and the number of pilgrims was extremely high so that some sort of "stand on the right" rules had to be implemented to facilitate the access to St. Peter's. The bridge quoted by Dante is Ponte S. Angelo, the Castle is Castel Sant'Angelo and the Mountain is Palazzo di Monte Giordano. The picture shows a fresco in the courtyard of S. Gregorio Magno portraying the vision of an angel announcing the end of a pestilence. The fresco shows how the bridge and the castle looked at the beginning of the XVIIth century. ... «Dunque che a me richiedi? ..."Then what wantest thou of me? Dante was particularly angered by the simoniac behaviour of some popes who sold ecclesiastical preferments for their own profit. He shows them in Hell, stuck upside down in narrow holes in the ground with their feet on fire. The verses describe the meeting between Dante and Nicholaus III, Giovanni Gaetano Orsini, pope in 1277-80, who admits his wrongdoings by using a metaphor making reference to the family symbol, the bear. The bear is known for being very gluttonous. His acts, aimed at favouring by all means his nephews, brought him wealth above (on Earth) and pain in Hell. 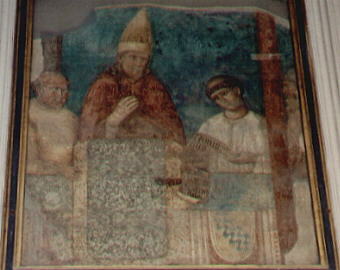 The picture shows a plinth now in the Vatican Grottoes and once a part of the lost monument to Nicholaus III in old St. Peter's. 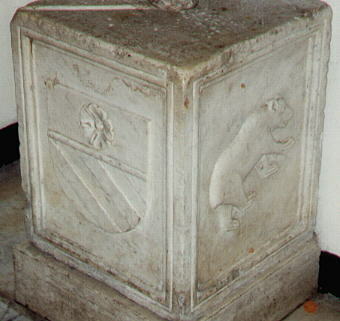 The left side shows the Orsini coat of arms while the right side shows a bear, the family symbol (Orsini = little bears). According to the myth, Cacus was a centaur who lived in a deep cave in the valley between the Palatine and the Aventine: he stole the two finest bulls of Heracles, by dragging them backwards by their tails into his lair. Heracles noticed that the cattle were missing and searched in vain for them. He had decided to move on with the remaining herd when the bulls hungrily lowed and Heracles was able to trace the cave where they were kept. He was so angry that he battered Cacus' face to pulp and he went on hitting him well after his death. When Dante visited Rome the Aventine was abandoned (with the exception of the monasteries of S. Sabina and S. Alessio). The arches of the walls built by the Romans on the southern steep corner of the hill were covered by spontaneous vegetation: they had the appearance of cave entrances. The episodes narrated in the poem became so widely known in Florence that a gigantic statue inspired by Dante's description of Hercules and Cacus was put (and still is) at the entrance of Palazzo Vecchio, opposite the statue (now a copy) of Michelangelo's David. The picture shows a detail of this statue by Baccio Bandinelli. Bonifatius VIII was perhaps the person Dante despised most. Very often Dante did not explicitly call by their name the various personages he met in his journey, but he used an indirect approach. For Bonifatius VIII he chose the infamous title of Prince of the Pharisees and he pointed out that he waged war against other Christians and not against the followers of other religions. The words near unto Lateran in these verses stand for "with the members of the Colonna family", with whom Bonifatius VIII engaged in repeated fights. The Colonna threatened the Lateran, then the residence of the pope, from their fortifications on the Qurinale hill. It was from a loggia in the Lateran, that Bonifatius VIII announced the first Jubilee. 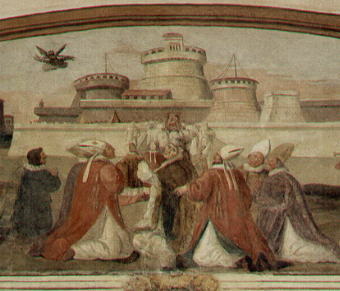 The picture shows a fresco in S. Giovanni in Laterano portraying the moment of the announcement. In the past the fresco was attributed to Giotto. Dante, in order to describe the size of the giant Nimrod's face, compared it with the bronze pine-cone which once stood at the entrance of St. Peter's. Nimrod was the king of Babylon who wanted to build a tower to reach the sky. The pine-cone, once a Roman fountain, is now in Cortile della Pigna in the Vatican. A quarter of Rome (between S. Maria sopra Minerva and Via del Corso) is named after it. The French painter Gustave Dorè (1832-83) is one of the best known illustrators of La Divina Commedia: he drew gigantic, muscular figures clearly inspired after works by Michelangelo. Before him, Edward Blake (1757-1827) had illustrated some episodes of the poem in a more spiritual manner. 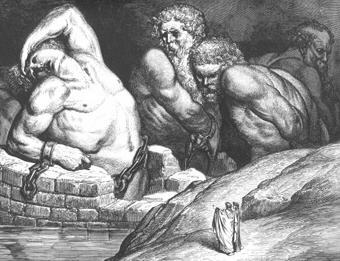 The image shows an illustration of the meeting between Dante and the Giants by Gustave Dorè. A mountain was the traditional representation of Purgatory. At its base an angel watched the heavy gate which controlled the access to it. Dante compared the sound he heard when the gate was opened to allow him and Virgil to continue their journey, with the sound of the doors of the Aerarium, the Roman Treasury, when Julius Caesar had them forced to take possession of its contents. The Treasury was located immediately below Rupe Tarpea and the main temple of Rome dedicated to Jupiter. 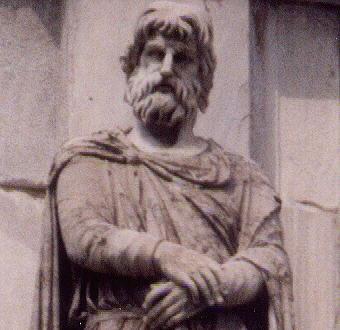 The tribune Lucius Cecilius Metellus was the custodian of the Treasury and he vainly opposed Julius Caesar. Because the hill above the building slid down during the Middle Ages, at the time of Dante nothing of it was visible. It is therefore possible that Dante had in mind the bronze panels of the nearby Curia Julia which were still in place (although the building had been turned into a church dedicated to S. Adriano). In the XVIIth century the bronze panels were moved to S. Giovanni in Laterano to close the main door of the basilica, which had been renovated by Francesco Borromini in 1644-55. 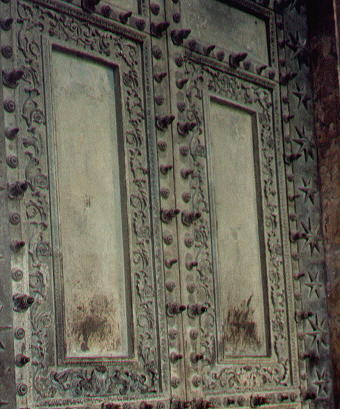 The image shows the lower bronze panels of the main door of S. Giovanni in Laterano. They were framed in a decoration showing the heraldic symbols of Pope Alexander VII. Che di dietro a Micol mi biancheggiava. Sovr'essi in vista al vento si movieno. The most famous Roman emperors were pagan, but some of them were rescued from Hell. Trajan was pardoned and moved to Purgatory due to the intercession of St. Gregory who prayed for his soul. Dante described (without being specific about Colonna Traiana) a marble relief showing the events of Trajan's reign. He made reference to a legendary episode in which the emperor delayed his departure for war to render justice to a widow. 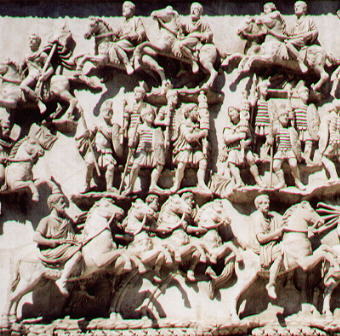 Trajan is portrayed among a host of chevaliers with golden eagles (the Roman standards) moving in the wind. In the reliefs of Colonna Traiana some small objects like lances and standards were cast in gilded bronze and put in the hands of the marble figures. Because in Colonna Traiana the emperor was usually portrayed while he delivered a speech to the troops, Dante might have had in mind later reliefs where the emperors were shown leading their cavalry. The image shows the high relief once at the base of Colonna Antonina and now in the Vatican Museums. The backgrounds of the two tables above show portraits of Dante by Raphael (frescoes in the Vatican).